This brand new Electrohome HiFi system looks incredibly cool and I've wanted to mention it here for a while. But as the old saying goes, looks are only skin deep. I don't recommend it because you can get far better gear for much less. If you're in the market for a budget turntable that offers decent quality with readily available replacement cartridges, check out the Audio-Technica AT-LP60 ($90 on Amazon). This belt-driven automatic table runs at 33 1/3 and 45 RPM and accepts affordable ATN3600L cartridges. 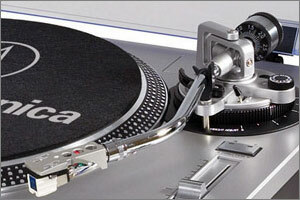 It also includes a built-in phono preamp, just in case your modern amplifier doesn't offer a turntable input. Finding an affordable amplifier on Craigslist or Kijiji is fairly easy these days, but it's hard to find a better new deal than the Lepai LP-2020A+ Class-T mini amplifier (under $30 on Amazon) that we've raved about in the past. I no longer recommend Dayton Audio B652 speakers because of drastic component cost-cutting, but Sony SS-B1000 bookshelf speakers are an excellent compact replacement for under $70. So there you have it. For about the same price as an all-in-one Electrohome HiFi system, you can own a belt-driven Audio-Technica turntable with Sony speakers and a surprisingly good Tripath-based amplifier. And if you can get your hands on a second-hand amp and speakers, you can put together a sweet vinyl playback system for under $100. Forty-four years after the original Star Trek series was cancelled, the USS Enterprise and her crew return to the screen in a kaleidoscope of faux-Technicolor, dodgy gel lighting and vintage musical cues. Of course, times have changed since the late-1960s heyday of studio television. 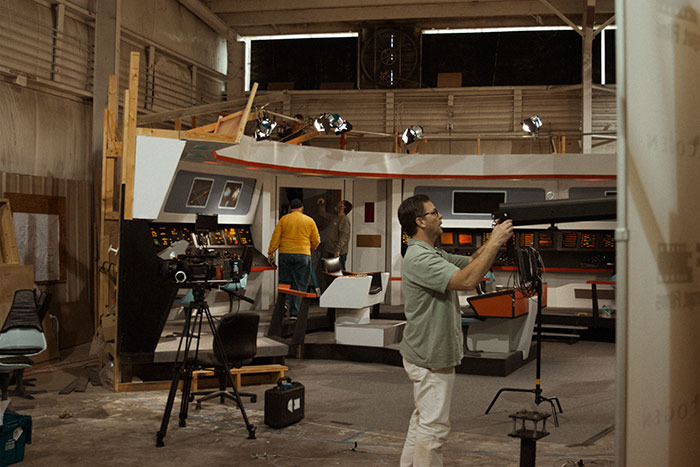 This time around, Star Trek Continues has been launched as a Kickstarter pledge drive. Their goal? To boldy continue their rudely interrupted 5-year mission as a non-profit fan-driven web series (with the full blessing of CBS). The cast includes voice actor Vic Mignogna as Kirk, Grant Imahara of Mythbusters as Lt. Sulu, along with Chris Doohan, son of the original Mr. Scott. Following the successful completion of their first episode, the team hopes to raise $100,000 to fund the production of three more episodes that follow the crew on the final two years of their mission. They're about half-way through the funding period and need another $44,000 to make the series a reality. To find out more, visit Star Trek Continues on Kickstarter. Long-time Retro Thing reader Duncan Waldron found these stunning metal pinhole cameras that are equal parts art and science. The Heartbeat camera was created by Kwanghun Hyun. It incorporates a Unitas 6497 movement that controls the exposure time with ridiculous mechanical precision. The film spool is actually mounted outside the camera case, a quirk that reduces the size of the machined body and adds a bit of analog intrigue -- there's no mistaking this for a digital camera. Pinhole cameras don't have glass lenses. Instead, they use a tiny pinhole aperture -- basically a lightproof box with film on one side and a tiny opening on the other. Much like a lens, light passes through the pinhole and is cast inverted on the film; the smaller the opening, the sharper (and dimmer) the image. While simple, this technique requires lengthy exposure times. The payoff? Beautiful, dreamlike images. He explains the difference: "Heartbeat 1 is a beautiful box of brass with plates, knobs and rings all machined by the artist himself. Of course, the most striking element is the modified Unitas 6497 mounted to the front of the camera. As you can see the crown, complete with crown guards, protrudes from the side of the unit, as the movement must be wound to function. The Heartbeat then would work like most cameras. Set the shutter speed, press the shutter release and the film is exposed. Heartbeat 2 is essentially the same thing, except the movement has been rebuilt. Mr. Hyun made his own movement plate and bridges, took apart an existing movement and reassembled it. The end result is a more streamlined camera shape, with the watch contained within a sealed compartment on the top of the camera. While the camera is fascinating unto itself, that fact that he essentially redesigned a watch movement to have a new architecture, but the same components is really remarkable." This one-off console stereo combines vintage and modern audio technology in a magnificently handcrafted case. On the vintage side, the turntable is a late-1970s Yamaha, an elderly JVC equalizer lets you tweak frequencies the old-school way, and a vintage 5-inch CRT has been hacked to display Lissajous waveforms that throb and twitch in time to the music. Oh, I almost forgot the funky analog VU meters. Don't despair if your musical collection is solidly in the 21st Century, because a Raspberry Pi single board computer is built in, running an Air Play compatible app that streams music over Wi-Fi from your mobile devices or computer. "To capture the vibe of something old, the best way to do it is to use stuff that's actually old. Gathered off of eBay, Craigslist, pawn shops, and from my own arsenal, most of the components came with a few years behind them. The turntable mechanics are from a Yamaha YP-D4 (1978), the equilizer a JVC SEA-10 (1976), and the CRT is an Emerson from the 90s. Creating something new with second hand items is half the fun of it. Re-imagining how they're used and giving them a second life is a fun challenge with a great payoff. The aesthetics, with the wood, brushed aluminum, and braided cloth cords, are also heavily inspired by vintage Hi-Fi gear. The knobs authentic, coming off of an old Peavey mixer. At the heart of the device lies a Linux driven Raspberry Pi. It operates as the Wi-Fi receiver, allowing music to stream wirelessly from any mobile device, laptop, or desktop computer. Compatibility extends across most digital libraries, including Spotify, iTunes, and Pandora. The Pi serves as a platform for many possibilities. It can also operate as an output device, streaming music from the record player out to other WiFi enabled audio speakers. The speakers here are powered by a Klipsch ProMedia amplifier, feeding two stereo channels and an 8” subwoofer. Both channels have two mid-range drivers and a crossover splitting out a high frequency tweeter." Todd's website has a brilliant 'Process' section that highlights various aspects of the design and construction. If he can build something like this on his coffee table, maybe you can, too! Yes, I know we live in the digital age. That doesn't stop me enjoying a good book or even reading a newspaper once in a while. Alas, it's been several years since I shot real film. Instead, I capture life's little moments with my phone. And then I forget about them. Fujifilm's diminutive Instax Mini 90 camera is a wonderful way to ensure that your snapshots linger in the real world. Each cartridge shoots ten 62mm x 46mm instant prints, so you can give your friends physical mementos of your pub crawls, outings and 50 Shades re-enactments. The camera features a 60 mm F/12.7 lens with macro mode, automatic exposure and an automatic flash with red-eye reduction and brightness control. It weighs in at a reasonable 296 g and the NP-45A rechargeable battery is good for about 10 packs. Real photos aren't cheap, but instant prints are definitely more fun than Facebooking an endless stream of Instagram snapshots. There's no word on when the mini 90 will be available in the US and Canada.